In recent years, the federal government has made a large shift in how it expends taxpayer dollars on federal contracts. 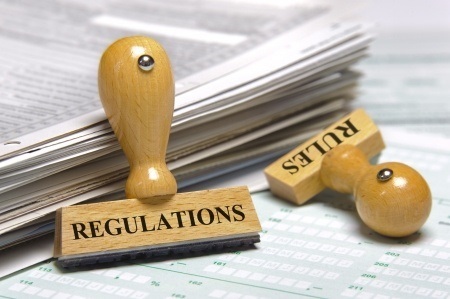 Numerous laws have mandated new or expanded use of rapid procurement processes or other transaction agreements (OTA), which are now a preferred procurement vehicle. 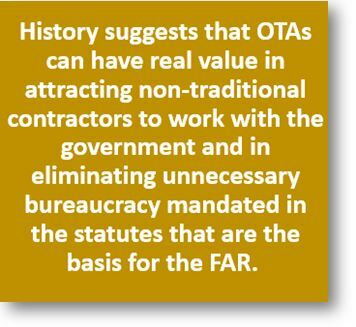 OTAs, while not contracts governed by the Federal Acquisition Regulation (FAR), are legally binding contracts that were once considered tools of last resort because they put taxpayers and the government at risk. The theory behind OTAs is that nontraditional vendors would be lured into the government contracting marketplace by streamlined procurement processes. The hope is that nontraditional contractors that were unable or unwilling to enter into traditional procurement contracts would come to the table and bring with them innovative solutions that traditional contractors were not offering. The reality, however, is that these speedy buying procedures are being leveraged by large traditional contractors that are looking to boost their bottom line by avoiding normal contract administration, oversight, and accountability protections. “Other transactions” is a term commonly used to refer to the authority to enter into transactions other than contracts, grants, or cooperative agreements. Agencies have authority to award such agreements in limited circumstances — research, prototype, and now defense follow-on production projects. 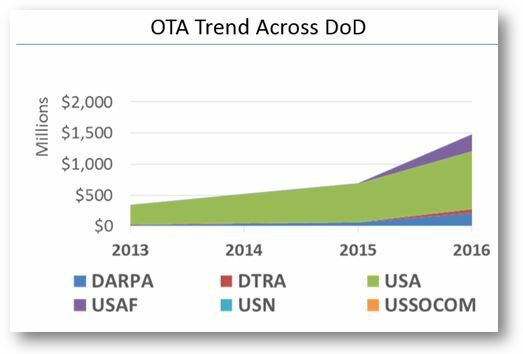 Unlike a normal government contract, OTA is promoted as a more flexible agreement that can speed up the buying process and be better tailored based on changes in technology and the government’s needs. The biggest risk in federal acquisition today is not taking enough risks. Not reckless risks, but deliberate risks consistent with Federal Acquisition Regulation Part 1 guidance. The largest chunk of U.S. research and development spending, the most significant technological innovation, and its fastest evolution all reside in the private sector. And the private sector has little interest in slogging through the rule-burdened, prescriptive, intellectual-property-devouring federal procurement process. These facts are driving a tidal wave of change in government buying, especially in Defense organizations. Not only is the Pentagon challenged in attracting the most innovative companies in America’s most vibrant business sectors, but our adversaries—like Russia and China—have little acquisition oversight or regulation so they are beating us to the cutting edge. The Department of Defense recently published a new guide to Other Transactions Authority (OTA) contracts. The guide attempts to answer a number of questions associated with the policies and practices surrounding OTAs. It partially succeeds, but it also falls short of providing the details both contracting officers in government and industry representatives need to use OTAs with confidence and alacrity. Two helpful things the guidance makes clear are that OTAs are in fact contracts and that they are still likely to be very complicated contracts. There is a perception in some quarters that OTAs are a magic wand that can eliminate the difficulties of doing business with the government. The guide implicitly refutes that premise as it correctly catalogues the many details anyone contemplating an OTA vehicle has to consider. OTAs have real virtues, but they basically just substitute the world of commercial contracting for the world of Federal Acquisition Regulation (FAR) contracting. Anyone who has ever attempted to read a commercial contract for say a real estate sale or for cellphone service has some idea of how complex a commercial contract can be. OTAs can simplify doing business with the government substantially, but a good contract is a good contract and a bad contract is a bad contract, independent of whether it is FAR based or an OTA. The Air Force is looking for an innovative DevOps platform to seamlessly integrate into its current environment and is tapping a General Services Administration pilot program to avoid having to go through the arduous processes set forth in the Federal Acquisition Regulation. The Air Force — through a joint program between AFWERX, the Air Force Research Lab and Air Force Space and Missile Systems Center — is using GSA FEDSIM’s Commercial Solutions Opening, or CSO, pilot program to solicit bids from startups and private sector innovators who haven’t worked with the government in the past. Rather than abiding by the FAR, which can often take months or years to get through the step-by-step solicitation process, the CSO process allows the contracting agency to issue a request for innovative solutions and fund multiple lines of research and development at the same time. 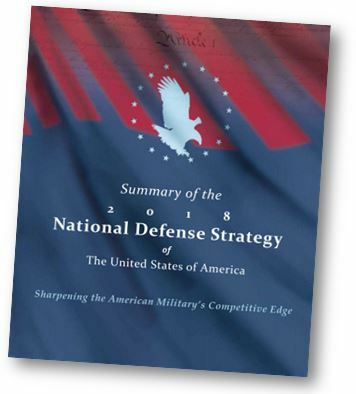 This “opportunistic model,” as described by the Pentagon’s Defense Acquisition University, is used for non-FAR-based contracts, like those issued using other transaction authorities.